Registration is now closed. The next course will be held in fall 2019. *All registration fees must be received or postmarked no later than March 4, 2019, or your registration will be CANCELED. This course is for registered nurses working in public health departments to address core public health nursing functions. This blended learning course includes two prerequisite online modules, required reading, a two-and-a-half-day in-person session in Chapel Hill, N.C., and completion of a final exam. The prerequisite modules will familiarize participants with the practice, issues and challenges of public health in N.C. and review basic epidemiological concepts important to the practice of public health. 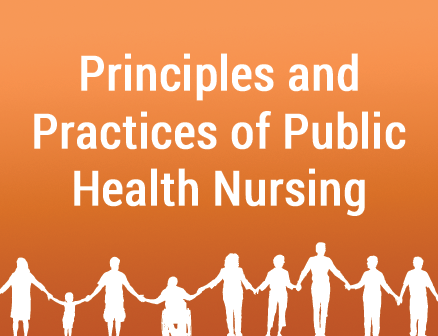 The in-person session emphasizes a synthesis of nursing practice and public health. Nursing services directed to individuals, families and groups will be presented in the context of improving the health of the populations. The target audience is registered nurses working in local health departments, particularly those who do not have a BSN degree. Successful completion of this course is a legal requirement for all public health nurses who do not have a BSN during their first year of employment with a local health department. Ideal timing is after the first six months of employment, but the course must be completed within the first year of public health practice. Nurses with a BSN degree are also welcome to enroll in the course. Many find it a useful resource in acclimating to the public health environment. The course is a prerequisite for the Physical Assessment of Adults and Child Health Training ERRN courses for nurses who do not have a BSN. The Principles and Practices of Public Health Nursing Course is an intensive course requiring extensive pre-class preparation including reading and pre-requisite training modules that must be completed at the home agency prior to the in-person training. Course reading and prerequisite work may take up to 40 hours to complete. 25.75 CNE contact hours will be provided through the Public Health Nursing and Professional Development Unit (PHNPDU) in the North Carolina Division of Public Health. The Public Health Nursing and Professional Development Unit (PHNPDU), North Carolina Division of Public Health, is approved as a provider of continuing nursing education by the North Carolina Nurses Association, an accredited approver by the American Nurses Credentialing Center’s Commission on Accreditation. Special Note: Nurse Licensees are required to attest to having completed one of several learning activity options during the preceding license renewal cycle and be prepared to submit evidence of completion if requested by the Board. Most of the learning activity options include continuing education activities related to the nurse’s practice. The Public Health and Professional Development Unit qualifies as an acceptable provider of continuing education as defined by the Board of Nursing for the Continuing Competence process. Attendees must complete all prerequisite work and reading, attend the full in-person program, pass a final exam and complete the participant evaluation in order to receive CNE contact hours. No partial credit will be awarded.